There’s a new face in the rallycross world and he’s known as the “Flying Frenchie.” Guerlain Chicherit has joined JRM Racing to contest the upcoming French and Italian rounds of the biggest off-road contest in the world, the FIA World Rallycross Championship. 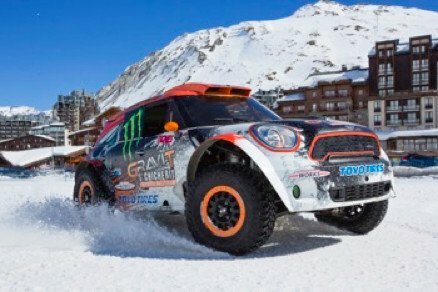 After being a former World Extreme Ski Champion, breaking a World Record by back-flipping a car (see video below), winning the FIA Cross Country Rally World Cup and now having 10 Dakar Rallies under his belt, Chicherit will now take on the sharp, short and exciting circuits that make World RX one of the most spectacular championships currently running. Guerlain will drive one of JRM’s race-winning MINI RX Supercars at Lohéac, France and Franciacorta, Italy. The two-event program will mark the 36-year-old’s first foray into the ultra-competitive World RX series, where he will be competing against fellow Monster Energy teammates Liam Doran and World RX Champion Petter Solberg amongst other well-known names in motorsport. Chicherit is keen to take the wheel of the MINI RX Supercar that JRM is developing this season. On competing at Lohéac in France, an event that traditionally attracts a huge crowd of over 70,000 race fans, Guerlain said it will be particularly special for him. JRM Racing Team Principal, James Rumsey, believes Chicherit will be a strong addition to his development team’s line up in France and Italy.